both the fertile and fissile material is within the same carrier salt. It might be added that moderators and fission products can also be carried in the single fluid carrier salt. Everything goes into a single pot. Both Oak Ridge National Laboratory (ORNL) Molten Salt Reactors (MSRs) were single fluid reactors. There are both fairly obvious and some less obvious advantages to the single fluid approach. David LeBlanc listed the advantages. In the fall of 1967, however, information was obtained that made a single-fluid MSBR, in which fissile and fertile materials are dissolved in the same salt, appear practical and attractive. The two-fluid study was set aside and a design study of the single-fluid system commenced. 1. Research it, the processing of the molten-salt fuels showed that protactinium and other fission products could be separated from the salts containing both uranium and thorium by reductive extraction into liquid bismuth. A single salt containing both the fissile and fertile materials could thus be processed, although with more difficulty than if separate fuel and fertile salts were used. 2. Nuclear calculations indicated that a conversion ratio greater than 1.0 could be achieved in a one-fluid reactor with an acceptably low inventory if the graphite-to-fuel ratio were reduced in the outer regions of the reactor, core. While the fuel specific power feil short of the performance of a two-fluid type, yields of 3 to 4%/year were indicated. 3. Reactor exposure limitations were found to exist relative to use of a graphite moderator, making it necessary to design for graphite replacement. In a two-fluid reactor it appears more practical to replace the entire reactor assembly, including the reactor vessel, when replacing the graphite. The single-fluid MSBR, however, permits easier access through the top head, so that only the core graphite need be replaced. 4. 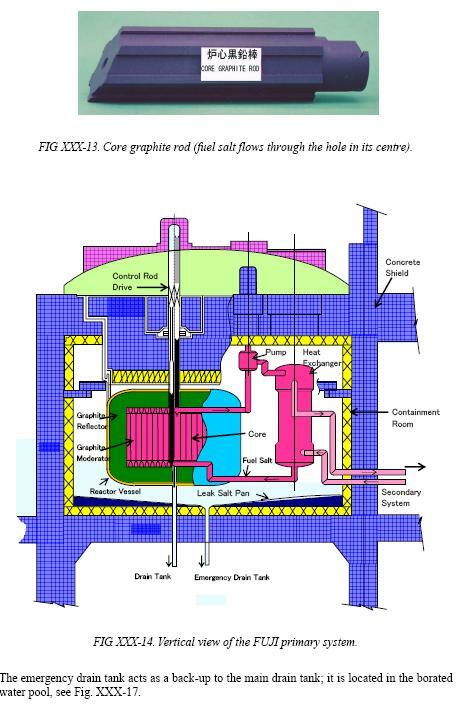 The two-fuid concept depends upon the integrity of the graphite "plumbing" in the reactor vessel to keep the fuel and fertile salt streams separated. The single-fluid des:gn eliminates this potential problem. 5. Radiation damage to graphite during reactor exposure leads to dimensional changes in graphite which are more easily accommodated in a sinsle- fluid MSBR than in a two-fluid design. Point 3 above is important to discuss. A positive temperature feedback coefficient is generally a bad thing for any reactor design. It is not as serious as may be thought however since the positive term results from effects of the graphite which will lag behind any temperature increase in the salt by tens of seconds at least. Original ORNL work thought it to be slightly negative, recent French studies have shown that to be mistaken. This was mainly due to older calculations treating the graphite and salt mix as homogeneous. In order to solve this problem without destroying the ability to breed, French proposals have gone the route of having an extra Thorium blanket around the core (radial only, not axial). This make it a partial 1 and 1/2 Fluid reactor. The problem which has been the focus of much attention by French researchers, is that ORNL's single fluid MSBR had a safety flaw in the ORNL one fluid design that if not corrected, could cause loss of control in the ORNL designed one fluid MSBR. This flaw is probably not fatal, but the French seem anxious to not simply replicate ORNL research, so they have made a big deal of it, and at any rate some, but by no means all, reactor design specialists are concerned enough to write off the one fluid graphite moderated MSRs. The Japanese company International Thorium Energy & Molten-Salt Technology (IThEMS) plans to build a very small 10 MWe Mini-FUJI MSR as well as a larger FUJI MSR in the 100 MWe range. Both FUJI Reactors rely heavily on ORNL developed technology. Both reactors will be designed as converters rather than breeders, both will be single fluid reactors, and both will use the thorium fuel cycle. ORNL reactor scientists were not all in agreement on the superiority of the single fluid MSBR design. Many continued t0 believe that the two fluid approach offered advantages. Just wanted to point out that since I wrote that first overview on Single and Two Fluid designs a few years back I've learned two main interesting new facts. First is that even in Single Fluid graphite designs like the MSBR that Pa removal is not necessary to break even. ORNL 4541 has a nice graph on page 162 to see this (S=1.5MWt/kg). The MSBR breeding ratio would drop from 1.065 at 10 day removal to 1.026 if they didn't bother. Second is that for the DMSR, Oak Ridge's large, low power converter that runs off Low Enriched Uranium and Thorium that the positive reactivity problem is non existent. I am still trying to work out how much is from the low power density and how much from U238 being present. I.e. not sure if a smaller, higher power density core would also be fine. I want to ask David Le Blanc and Charles if there are any advantages to be gained by scrapping the short lived graphite moderator and go for a heavy water arrangement instead. Is there anything wrong with having a Beryllium moderator in modern designs? Alex, Beryllium is not as good a moderator as graphite, and while heavy water is a very good moderator, it would also dangerous in a MSR core. Water is always a dangerous substance to put in high temperature nuclear core, and when the temperature rises to 700 C, a single leak is enough to cook your goose. I would like to mention Mr. LeBlanc's paper on Denatured Molten Salt Reactors in which he notes briefly a MSR pebble bed option: simple graphite spheres piled up in the path of the fluid flow would provide the moderation. The graphite pebbles would be vary cheap, easily replaceable , and replaceable on-line unlike a traditional 30-yr graphite channel core. Striking how the elegance and beauty of all these design concepts can be fit together.